Ohhh, I think that making extra whole wheat pizza dough and freezing it (when I made Whole Wheat Calzones) was a brilliant idea! 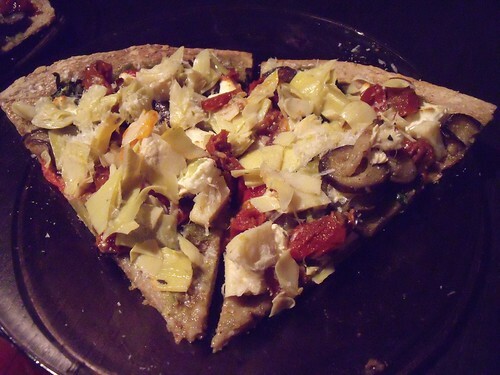 I was able to make a divine thin-crust pizza from scratch in about 30 minutes! I took out the dough in the morning and let it come to room temperature to defrost. By dinner time it was ready to simply top and pop in the oven. Perfect! If you haven’t got ready-made pizza dough on hand, I’ve included the recipe here once again so you can make yourself some dough — this will make enough for 4 thin-crust pizzas, so that you can keep some on hand for future easy dinners! 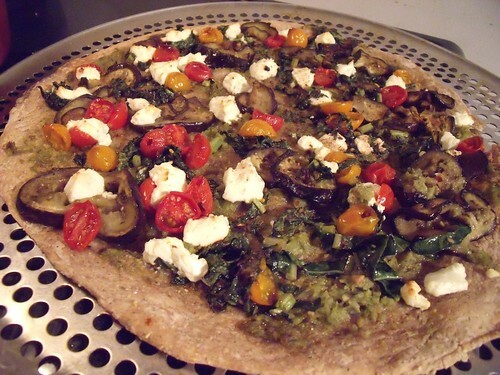 Makes 1 thin-crust pizza, about 9″ in diameter, serves 2. In a small bowl or measuring cup, combine warm water and yeast. Let sit for 5 minutes, then add the room temperature water and oil. Stir to combine, then set aside. In a stand mixer with the paddle attachment, combine flour, salt, seasoned pepper (or dried herbs), and chili flakes. Mix to combine on lowest speed. With the mixer running on low, slowly pour the yeast/water mixture into the flour mixture and let the mixer run until all ingredients are combined, and the dough has just formed a ball, about 30-60 seconds. Switch the mixer’s attachment to the dough hook, and turn the mixer on to knead the dough for 7-10 minutes, until the dough is quite elastic. Remove the dough from the mixer bowl, and transfer to a clean & oiled bowl. Cover and let rise at room temperature until doubled in size, about 90 minutes to 2 hours. While the dough is rising (or coming to room temperature if you are using pre-made dough from the fridge or freezer), prepare your toppings: Place the slices of eggplant in a colander and sprinkle with salt. Let sit for 20 minutes so the bitter juices leach out. Rinse well, and pop the slices into a pan with 1-2 Tbsp. of olive oil, and saute over medium heat until the slices have browned on both sides, about 8 minutes. Remove the eggplant from the pan, and set aside. Add the garlic and onion. Saute over medium for 2-3 minutes, until the garlic and onion have softened, then add the kale & chili flakes, and saute for 3 minutes more, until the kale is bright green. Remove from the heat and set aside. Once the dough is ready to bake, preheat the oven to 400F. Flour your work surface lightly (or dust with cornmeal), and roll out a quarter of the dough into a round about 23 cm in diameter (9″). Pop the remaining dough in air-tight plastic bags and keep in the fridge for use later in the week, or into the freezer for later use. 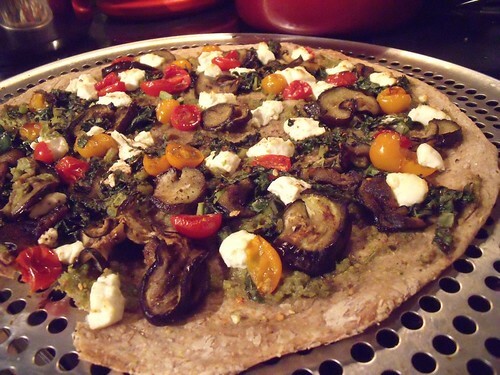 Transfer your pizza round to a baking sheet (I’ve got a round one with holes in the bottom to maximize air flow), and spread with garlic scape pesto. Top with eggplant, onion/garlic/kale mixture, tomatoes, and chèvre. 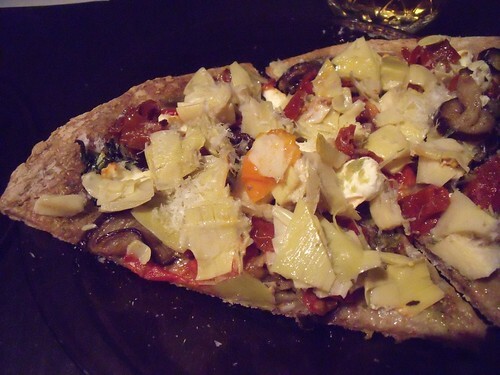 Pop the pizza into the oven and bake at 400F for 20-30 minutes, until the crust has browned nicely and crisped up. Remove from the oven and let cool for 5 minutes. Cut into slices and serve along with your favourite pizza condiments; we love Frank’s Red Hot Sauce, tabasco, and chili flakes.